GE manufactures a number of popular kitchen appliances, including their line of built-in, space-saving microwave ovens. The ovens are installed in brackets over your countertop or cooktop, saving valuable space. The brackets are screwed into the wall and kitchen cabinets, providing a sturdy holding place. The microwave is then secured to the cabinet above by two retaining screws. Removing a GE built-in microwave oven requires the use of an assistant. The ovens are heavy and removing one by yourself could result in an injury or accident. 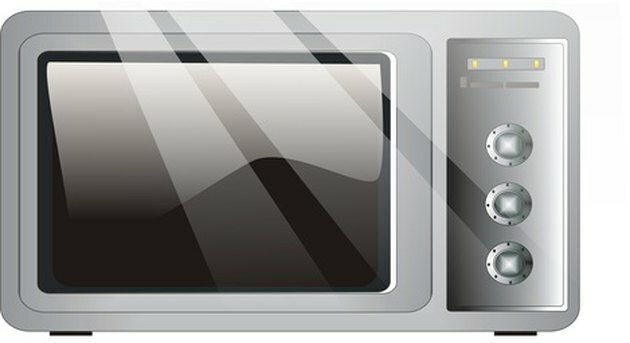 Remove your GE built-in microwave oven for servicing. Unplug the oven from the wall. Depending on your installation, the outlet might be hidden in the cabinet above the GE built-in microwave oven. Open up the cabinet above where the microwave oven is installed. Have an assistant hold the oven by the bottom. Locate the two screws holding the microwave in place on the bottom panel of the cabinet. Loosen these screws. Ensure that your assistant has a grip on the microwave, then remove the screws entirely. Slowly lower the microwave until it is at a 45-degree angle. Gently lift the back of the microwave off the rear bracket holding it in position. Pull the electric cord through the hole in the bottom of the cabinet.